I would have to echo the previous posts about Ellicottville. Nice little place to stop off on the way up 90 to Niagara Falls. The area is a bit run down and this is obviously an old bar, but it has a neighborhood feel. Definitely has character. The vibe was very friendly and the bartenders were interested in what you liked, what you didn't and how to make the visit as good as possible. Note, my review is 5 years from the last one, so the quality at this brewery has maintained over time. They had a food menu but we just stopped off for a sampler and didn't eat. Menu looked decent although not lengthy. I was tough picking a sampler. Really enjoyed both the oatmeal stout and the brown ales. Both very good examples of each and enjoyed them very much. Tried their winter ale, it was probably the least favorite of the group, but overall nothing wrong with it. Then we tried both their regular IPA and their session IPA. The session IPA was excellent and really tasted more like a regular IPA. Overall, this is a place worth the visit if you find yourself traveling 90 in NY. Every summer I travel to Dunkirk for some walleye fishing. 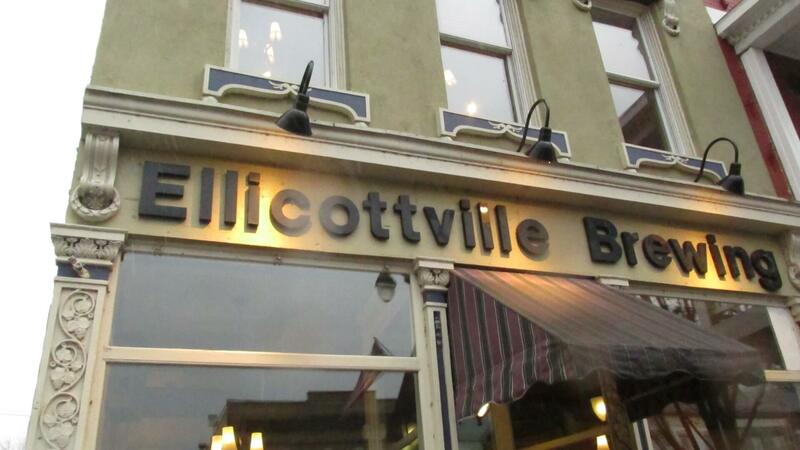 And while there I make a trip over to Fredonia to visit Ellicotville Brewing Co., usually for lunch. The fact that we go back every year says something about this place. They have a good selection of brews. I've tried most of the beers and have not found a bad one yet! The food and service are always good too. It's a small place with a nice atmosphere. The long bar takes up a good bit of the space, but there are enough tables too. There is no parking lot, but there is plenty of on street and municipal lots within easy walking distance. Stopped in for Lunch on a Friday while heading from Niagara down to Erie, PA. Food selection on menu was nice. Had wife and kids and everyone found something to eat. First floor was a long bar with a scattering of tables, I believe there was an upstairs for sitting as well and an outdoor area. Felt like a bar sure it was one for along time being in the downtown area of a small town. Beers, I tried there summer wheat on tap, and it was a American style which was good nice summer beer, Also tried there Blueberry wheat which was a very good fruit wheat in my opinion. It is served in a pilsner glass with fresh blueberries in it. Also the they had a October on tap which was a Helles style. I have always found Octobers to be Marzen style. But it was light and refreshing. They had all there regulars on tap and two seasonals I did not ask if they had a guest tap. They offered there Nut brown and blueberry wheat in bottle (6 packs) They also offer two style of growlers the normal twist cap that is heat shrinked and then the nicer flip top one which was considerably more money. Certainly worth a stop if you heading through the area.